A well-known Greek myth tells of Hades kidnapping Persephone and taking her to the underworld. 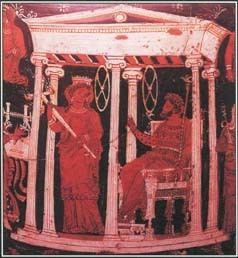 This vase painting shows Persephone and Hades as rulers of the underworld. See also Cerberus ; Demeter ; Elysium ; Furies ; Greek Mythology ; Lethe ; Persephone ; Styx ; Titans ; Underworld . Hades has a helmet of invisibility so he is not seen on earth and he spends the cold months with Persephone and when she's on earth we have spring and summer Hades makes sure the souls cannot escape his land and back on earth when Persephone ate from the underworld she had to come back soon because of the rules were if you are from the underworld you either had to stay or come back soon at first she didn't Like it but legend says after a while she fell in love with Hades and she didn't want to leave but we don't know what is true and what's not. Cerberus also helped keep the souls in and the living out.